So the family behind one of the best and longest running Italian restaurants in Las Vegas (Ferraro's) decided to get into the casual pizza game, and the result is Pizza Forte, which has already opened two stores at off-Strip casinos Sunset Station and the Hard Rock Hotel. The pizza is great ... but this ain't allpizza. Forte brings the special dog goodness, exclusively serving up Hofmann hot dogs and sausages and it's the only place in Vegas with this product. For our first taste, we couldn't resist the Snappy Griller, a creamy colored pork and veal sausage with a crisp texture and smooth, satisfying flavor. 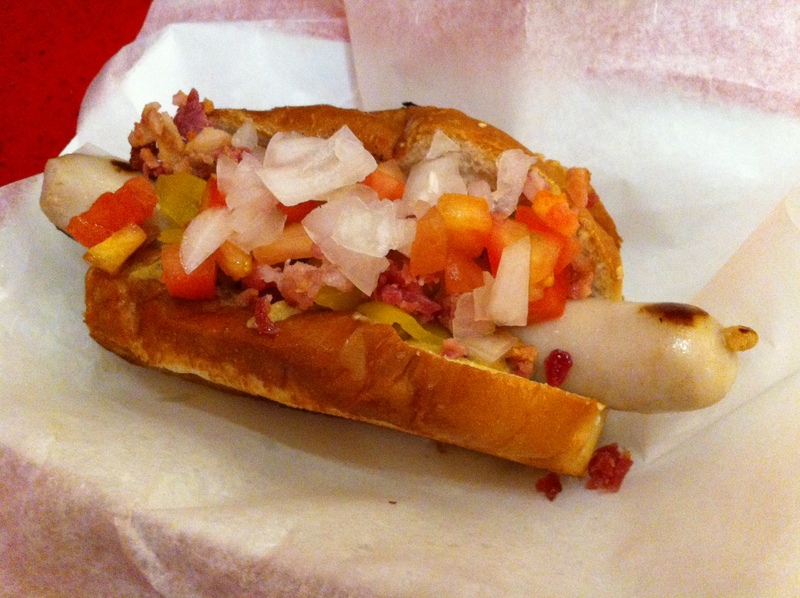 In fact, it tastes unlike any other sausage we can remember chomping into. The buns here are toasty, buttery New England-style things, the kind of bread you typically associate with a lobster roll. They're substantial and delicious. Forte is kinda cool and old school, which means you can grab your wiener and slide over to a well-stocked condiment bar to load that thing up. We packed it with mustard, onions, tomatoes, banana peppers and bacon. (Yep. Bacon.) The topping combo was solid, but this thing would have been scrumptious with just mustard.